WASHINGTON -- Wisconsin U.S. Senate candidate Eric Hovde (R) says he is sick and tired of reading sad stories about people struggling in the recession. Instead, he wants to see the media focus more on the debt and the larger problems afflicting the country. Hovde made his remarks during a presentation on Friday to the Greater Brookfield Chamber of Commerce. In fact, journalists already give short shrift to stories about individuals struggling in the recession. 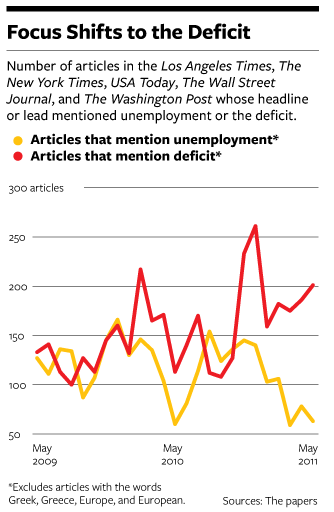 In May 2011, National Journal looked at the nation's five largest newspapers and counted how many times "unemployment" or "deficit" appeared in their headlines or first sentences. The analysis found that unemployment was covered significantly less than the deficit. "Mentions of unemployment have been dwindling since they spiked to 154 in the month ending August 15, 2010; over the month ending Sunday, there were 63," wrote National Journal, adding, "That major newspapers and other media outlets have covered the deficit with greater intensity in recent months should come as no surprise given the focus of the politicians and policymakers they cover. The declining mentions of unemployment are perhaps more surprising, as the issue remains salient for millions of Americans." Sean Lansing, a spokesman for the Hovde campaign, told The Huffington Post in an email that Hovde was saying "that issues like waste, fraud, abuse and out-of-control government spending are what's really hurting the poor and making the human interest stories possible in the first place, so the press -- and the public at large -- should be focusing on the root of the problem and how we can reform the system." Hovde, a Wisconsin businessman, is one of four candidates running for the GOP nomination for the state's open U.S. Senate seat. The winner will face Rep. Tammy Baldwin (D-Wis.) in November. A poll last month by Democratic firm Public Policy Polling showed Baldwin trailing Hovde and former congressman Mark Neumann by 4 percentage points, and former governor Tommy Thompson by 5, with a 4-point margin of error. The poll did not ask about State Assembly Speaker Jeff Fitzgerald, the fourth GOP candidate in the race. This article was updated to include comments from Hovde's spokesman.